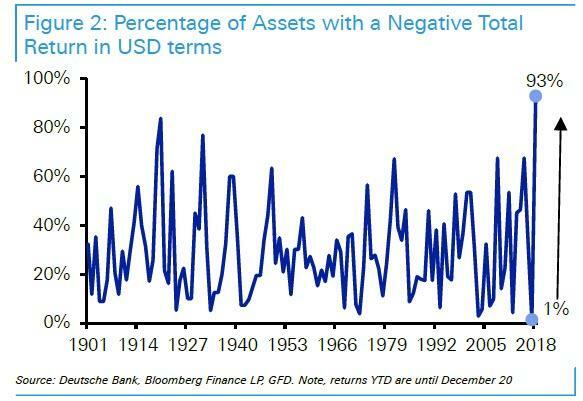 Remember when Deutsche Bank found late last year that 2018 was the worst year for markets since the great depression, with 90% of all assets posting a drop for the year? Now, one month after the December devastation, everything has made a drmatic U-turn, and global equities have bounced back violently from their "Mnuchin Masacre" Christmas Eve lows when the S&P entered a bear market for a few brief minutes, with the MSCI World Index up 11% from its lows and +6.3% year-to-date. And, in a mirror image of the chart above, SocGen's Andrew Laphtorne calculates that "a remarkable 87% of all MSCI World stocks are up to year-to-date; if that remains the same by the end of the month, it would rank as one of one of the best months ever for positive stock performance." 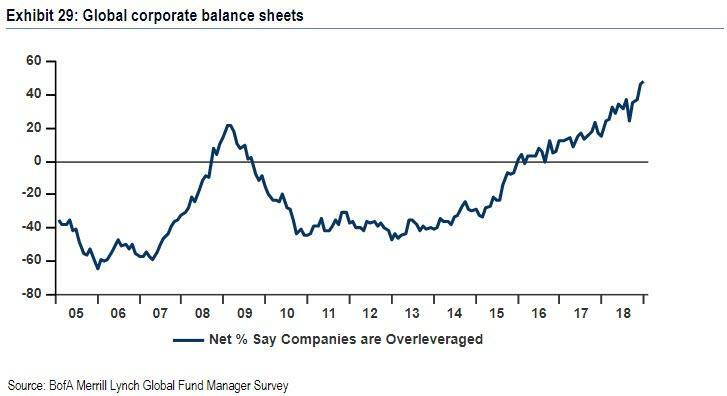 ... it is those companies with weakest balance sheets that are doing better so far in 2019. What has been behind this dramatic reversal in sentiment is simple - first, it was the Fed's dovish turn, with Powell conceding that both hiking is on "pause" and the Fed's balance sheet shrinkage is no longer on "autopilot" coupled with the increasingly more aggressive easing measures by China which culminated with the recent introduction of quasi QE as reported last week. But, as Laphtorne notes, it is also worth noting that January has historically been the strongest month for reversal strategies as shown in the chart below. And as the SocGen strategist highlights, in what may be the most profitably repeatable trade in recent history, selling the prior month's "winners" and buying the ‘losers' during January has a hit rate of over 70% in Europe. This, according to Andrew Lapthorne, presents investors with a dilemma: On the one hand the economic narrative is becoming increasingly bearish: weaker growth, lower consumer confidence and disappointing PMIs are pushing some market participants to question the rally, so sitting out this “dash to trash” makes sense, on the assumption that normal service will be resumed when the start of the year “risk-on” flurry fades. However, as the SocGen quant has pointed out on numerous prior occasions, Value stocks had become extremely "cheap", and whilst "this cheapness represents an opportunity, it is also a challenge to those for those of a bearish disposition" to sit out the rally. As a result, the risk according to SocGen, is that the macro outlook does not quite translate as it did in 2007/08 culminating with a financial crisis for the simple reason that Value stocks have been in a bear market for quite some time already. As such, Lapthorne suggests that instead of a crash, the 2000/01 playbook might be more suitable. Meanwhile, according to Barclays strategists there might be more to come as "Real money did not participate in the rally either, as mutual funds further reduced their equity exposure and added to bonds and cash" and "as flows tend to lag performance, investors will likely increase exposure to equities in the coming weeks." Of course, it was the point of bearish capitulation last January/February that led to the first correction of 2018. Will this year be a mirror image as the market continues to levitate, drawing in ever more skeptics, until one day we get the 2018 melt up deja vu, and the rug is pulled out from under the carpet? Perhaps, on the other hand there are enough potential catalysts to cripple investors' residual bullishness in the next few days. And with all eyes on Apple and May today, Powell tomorrow, Trump and Xi on Thursday and jobs on Friday, we may not have to wait that long to get the answer.